I love to eat outside. My childhood memories are filled with images of my mom fixing my sister and I picnic lunches to eat in our backyard, watching from our outdoor dinner table as my dad shucked fresh grilled corn, and then of course all of us eating grilled chicken wings at my best friend A's house after a long day of swimming. Even today, that love for eating outside remains. J and I love to sit on our porch (when it starts to get cooler) and eat dinner together. (We even have a chandelier hanging above our table so we can eat by candlelight!) 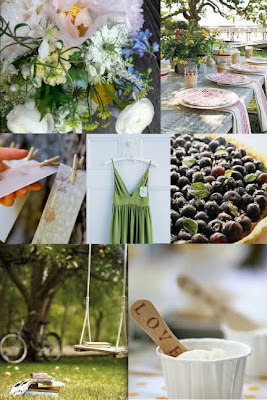 With all that said, today I thought I would share a board inspired by outdoor dinner parties. I love everything about them- from the homemade desserts made from fresh berries, to the bright jersey dresses all the girls dress up in and of course eating at a picnic table with citronella candles burning all around. Nothing is too fussy- centerpieces are made up of collections of wild flowers or herbs found in your garden or backyard, and the napkins can just be simple cotton tea towels. The best part is that this is the exact type of party that doesn't need a special occasion or cost a lot of money- just fire up the grill, invite some friends over and remember the bug spray!